Back and forth. Seen and not seen, peeking and hiding. On Sunday morning, my shiny black patent-leather shoes popped from beneath the wooden pew where I sat with my parents in our very proper church, and then they disappeared. My feet didn’t yet touch the floor, but boy, could they swing those shiny shoes. Back and forth. Peeking, hiding. Then I’d stand next to Mother in those stiff “good” shoes, propping my own hymnal on the back of the pew ahead of us, pretending to read the words. In fact, church may be the place I first learned to connect letters and sounds and phrases, for music has a way of winding the words around your heart strings and tuning them in with your brain. 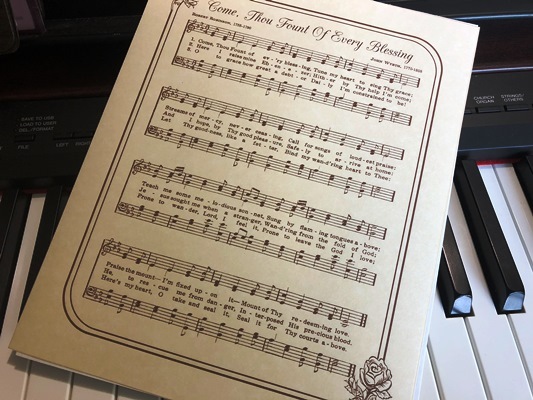 I learned the melodies and verses to many old hymns in our traditional church, and they’ve stayed with me over the years that have swept me into the musical freedom of contemporary worship. As a pianist/keyboardist on my church’s worship team, I love and play it all, both the old and the new. It was the melody that embedded in my young heart, tugging the lyrics along with it. Only later did those words take on meaning. Perhaps one has to experience the floods and fires of life and trudge through the mud and ash before one really understands the cleansing power and need of the Fount. According to several hymnals, the tune is a Traditional American Melody from John Wyeth’s Repository of Sacred Music, Part Second, 1813. However, Hymnary.org credits the melody for “Come, Thou Fount of Every Blessing” as the tune “Nettleton,” penned by “Anonymous.” Footnotes mention Asahel Nettleton (1783-1844) as the possible originator of the tune. Though little-known today, Yale-graduate Nettleton was the Billy Graham of the 1820s, according to author and Pastor William P. Farley. 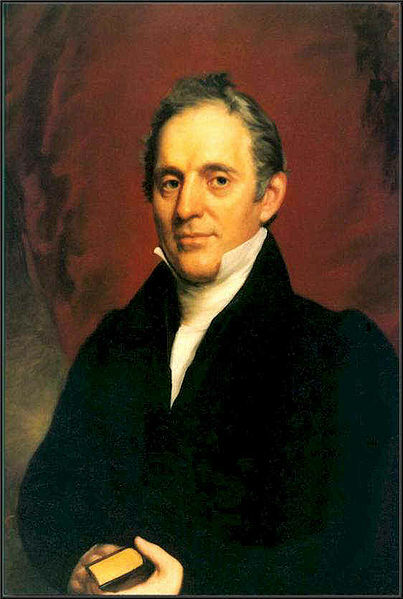 This quiet and unassuming evangelist from Connecticut saw the advent of the telegraph and railroads, and the exploration of Lewis and Clark, all linchpins of our nation’s development. He also lived during the ebb and flow of the second Great Awakening of the 1790s through the 1830s (historians debate the actual dates). He died in 1844 at the age of 61. 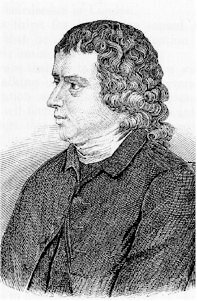 Stanzas 1 – 2 of the song are credited to English clergyman Robert Robinson in 1758 and stanza 3 to Martin Madan in 1760. Several variations of the stanzas exist, as well as a fourth and fifth verse, and the song rests today in the public domain. It also rests in the corners of my memory, and thus wended its way onto the pages of my recent release, An Unexpected Redemption. Redemption is the theme of “Come, Thou Fount,” and so it naturally flowed from my mind, through my fingers, and into the heart of Elizabeth (Betsy Parker) Beaumont. In the story, she credits her mother with teaching her the song, and perhaps I am that mother since I gave birth to the fictional Betsy and her impulsive nature. Regardless of a few obsolete words from centuries past, these confessions can touch the core of a seeker, one who may have wondered on restless childish feet, coming at last to the merciful Fount. My most favorite rendition of this song is by the very modern David Crowder band that presents it with rich Old World flavor. It can be found here. Bypass the quick ad and listen with your eyes closed. Let your heart be lifted. And then let me know if there is an old hymn that has made its way across the years and into the corners of your memory. Shattered by her father’s fatal choice, naïve Betsy Parker elopes with a faithless beau who abandons her for the Dakota gold fields. After taking a job as a type-writer for a prestigious Denver law firm, she rebuffs the advances of a senior partner who fires her and sullies her character. In a desperate bid to redeem her reputation and independence, she returns home to face her toughest critics—the people she grew up with, a rugged lawman who threatens to steal her heart, and the one person unwilling to forgive her. I love that hymn as well and find the line, "Prone to wander, Lord I feel it, prone to leave the One I love" running through my head and heart from time to time. Music in general awakens my heart to the Spirit and I love the song time at church. Thanks for the great post. I love your statement, "Music in general awakens my heart to the Spirit." So true, Connie! My all time favorite hymn. I didn't really grow up listening to it, it found me in my late 40s. I guess I needed it at that point in time. Thank you for putting it in my head today. Great post. Thank you, Debbie. So glad you enjoyed the post - and the song! Love that song. I've always wondered what it means when it says "Raise my Ebenezer." Any ideas? Vickie, please see my comment below. For some reason, 'Reply' isn't working consistently for me today! Vickie - yes, that reference to Ebenezer seems an antiquated saying. But I believe it refers to a memorial stone that the prophet Samuel set up to remind the Israelites that God helped them overcome the Philistines (I Samuel 7:12). Sometimes a visual reminder helps center us on what is important. Maybe that's why so many people wear crosses or have them displayed in their homes. I remember singing Come Thou Fount of Every Blessing growing up. Some of the other old hymns that have stayed with me are At Calvary, Sheltered in the Arms of God, No One Ever Cared for Me Like Jesus, Stand Up Stand Up for Jesus. Love the old hymns and glad we still sing some mixed in with all the new comtemporary songs at church.